Joanne Garone Behnke has replayed every possible scenario in her mind a hundred times. Maybe her 79-year-old aunt sought shelter at the sturdy condo nearby that withstood Hurricane Michael's devastating winds. Maybe she was rescued and is lying in a hospital bed somewhere. 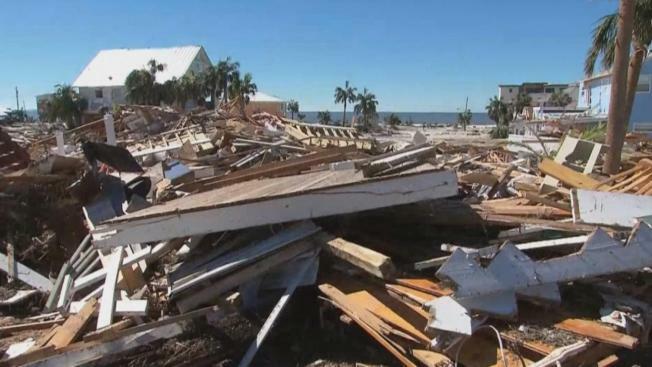 The pile of rubble that was once her Mexico Beach home is shallow, too shallow for a body to go unnoticed, Garone Behnke tells herself. "It's torture," says Garone Behnke, who last talked to her Aunt Aggie Vicari right before the storm hit, begging her to leave her cinderblock home. Five days after the hurricane slammed into the Florida Panhandle, people are struggling to locate friends and loved ones who haven't been heard from, though how many residents are missing seems to be anyone's guess. 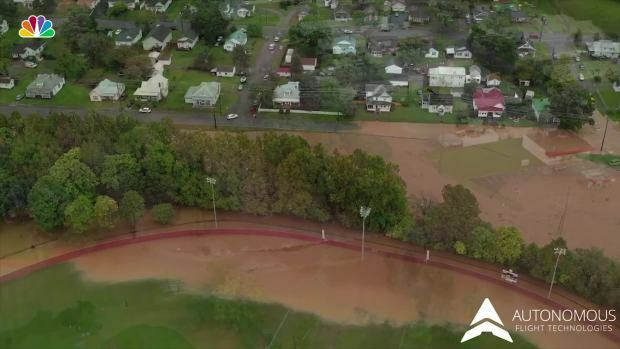 Drone Footage Shows Flooding in Salem, Va.
"I've been on the phone to reporters, to fire chiefs, to heads of task force from Miami, to you name it, I've called them. I've called every hospital," Garone Behnke said Monday, then stopped to look at a text from the fire chief in Mexico Beach. To her disappointment, it read: "We're still working on it ... we'll keep you posted." As President Donald Trump visited the devastated zone, the death toll from Michael's march from Florida to Virginia stood at 19, and the search for victims continued. As the hurricane closed in and more than 375,000 people were warned to evacuate, emergency authorities expressed frustration that many residents weren't leaving. Since the storm, many people have been rescued from the devastated zones. Emergency officials said that because of widespread cellphone outages, others could be safe and just haven't been able to tell friends or family. Rescue worker Trevor Lewis and the rest of his six-member squad lent their cellphones to storm victims so that they could contact loved ones for the first time in days. He said he watched them "cry out in joy." 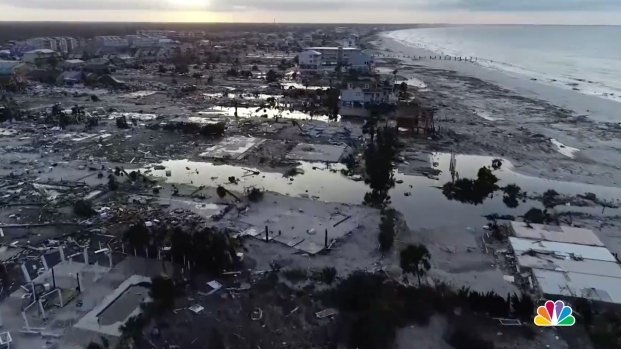 Footage shot on the ground and by drone caught the full extent of the damage done to Mexico Beach, Florida, by Hurricane Michael. "Just the desperation in the family members' voices that hadn't contacted their loved one for a few days was bad," he said. "Then we get on scene and find their family members and they have no food, no water, no power." There was just one confirmed death so far in Mexico Beach, the town of about 1,000 people that was nearly wiped off the map in a direct hit from the hurricane and its 155 mph (250 kph) winds. Mexico Beach City Clerk Adrian Welle told local media Sunday that 46 people were unaccounted for. That number had previously been 285, but officials think many left right before the storm hit. Other city officials told reporters that the number of unaccounted for was three. A Houston-based organization called CrowdSource Rescue that takes calls from worried family members and sends the details to rescue crews on the ground said it has helped find nearly 1,500 people across the region since Michael struck. George Ruiz, a former Coast Guard rescue boat driver from Alabama who runs Geaux Rescue, a nonprofit search-and-rescue operation, complained that authorities aren't allowing volunteer groups into hard-hit Mexico Beach and Panama City. "There's a lot of work to be done still as far as the rescue and recovery goes," said Ruiz, whose organization still has 433 requests for help from family members looking for loved ones. 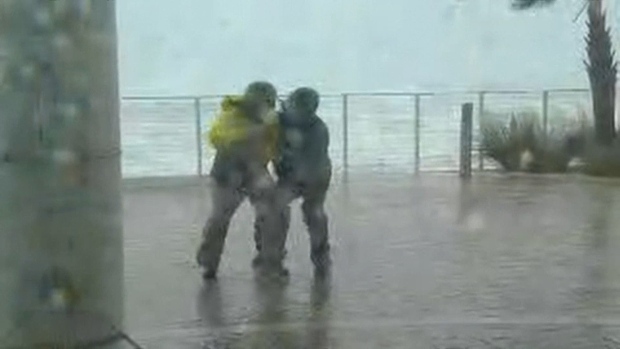 Hurricane Michael hit Panama City, Florida, hard. Drone footage show structures destroyed by the high winds, including a high school gym whose roof was torn off. "We listened to voicemails we received overnight," he said, "and you can just hear in their voice their desperation, wanting to know if their family member is alive and well or if their family member has passed." Melissa and Rodney Reinhardt spent days wondering whether Rodney's 79-year-old father survived the storm at his home in the devastated Port St. Joe area. "Our hope was that he evacuated but nobody had heard from him," she said. "It's horrifying not knowing. It's scary. Seeing the pictures on the news makes it even scarier." Emergency officials checked on him Thursday night and said he was there, but that was all the information they received. Rodney finally went in with a church group on Sunday and picked him up. "It was a happy ending," Melissa Reinhardt said. During his visit to the devastated zone, Trump commended Republican Gov. Rick Scott for an "incredible" response to the disaster and said: "You're a great governor." Scott, who is running for the U.S. Senate, returned the praise, saying, "Every time I've called, he's come through." 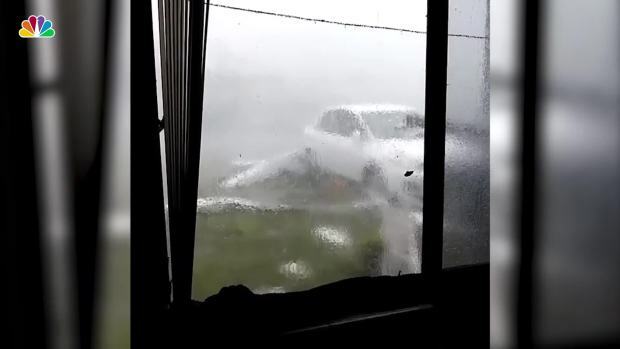 Video posted by Letisia Maloney shows what she saw as she rode out Hurricane Michael in her home in Panama City, Florida. Some in the affected area were lukewarm about the president's visit. About 5 miles from a neighborhood Trump visited, 57-year-old Sheila Vann sat on a cooler in her garage, taking a break from cleaning up. The hurricane tore off much of her roof in Panama City, and most of her ceiling collapsed. She had four freezers filled with fish and meat that were starting to spoil and smell. "You want to see the president?" Vann asked her husband, Joseph, with a dismissive tone. "I ain't got time, unless he wants to help clean up." Nanya Thompson, 68, of Lynn Haven, said of the president: "He's doing this, I believe, to project a different image of himself because of all the bad publicity he's had. He's not going into get into the sewage water with other people and start digging." "If this is just going to be another reality show, I don't think he should come," she added. One way to help people affected by Hurricane Michael is by donating to the Red Cross. Find more information on how to donate here. Contributors include Associated Press writers Brendan Farrington, Gary Fineout, and AP Photographer Gerald Herbert.